Some of the 240 solar panels at Seldom Rest Farms located, north of Myerstown, PA, on Wednesday, April 20, 2011. The farm maintains a crop, herd of sheep and 17,000 hens. The Hens are kept in a two story chicken house and produce approximately 2.5 million chicks each year. 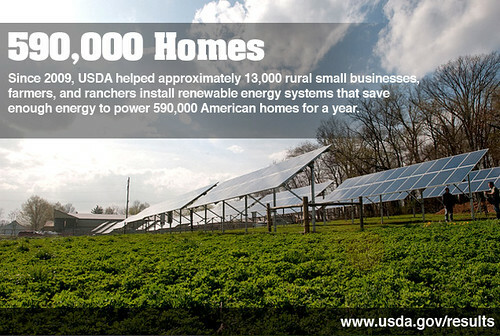 To supplement their electrical needs, they chose a contractor who knew about U. S. Department of Agriculture (USDA) Rural Energy for America program (REAP) grants and helped them through the application process. The farm was awarded a $152,000 grant (25% of the cost) to install the 1001kW solar array to power their farm, a neighboring farm and homes on the local electrical grid. The 240 solar panels were ground mounted with 5-foot clearance underneath to allow sheep to graze and rest underneath protected from the rain, sun or snowfall. 10 converters change the DC electrical energy from the panels into AC energy that goes into the local power grid. Spring statistics show it is producing more than expected. REAP offers grants and/or loan guarantees for the purchase and installation of renewable energy generating systems and for energy efficiency improvements. For additional important details about REAP, see www.usda.gov. USDA Multimedia by Lance Cheung.